An upper level trough moved into CO from the north last night helping decrease temperatures across the state and increase moisture east of the Continental Divide. Over the western slope, temperatures will be about 5F cooler than climatology. Winds will also decrease lowering the fire threat for today. East of the Continental Divide, overnight scattered showers accompanied the upper level trough over the Northeast Plains, leaving a moist, stable layer near the surface this morning. For example, the current temperature and dew point readings over Akron are 55F/52F. The ongoing scattered showers and cooler temperatures will limit the amount of instability for severe storms over the Front Range, Urban Corridor, Palmer Ridge and Northeast Plains. As pockets of clouds burn off midday, it will be possible for some instability to form. Therefore, scattered showers over the over higher terrain and the Palmer Divide are forecasted in this cloud-free environment. Rain rates up to 1” will be possible for the isolated thunderstorms that form. Further south, adequate low-level moisture combined with upslope winds continue to support cloudy conditions this morning. However, warmer morning temperatures and strong June sun will cause this moisture to mix out earlier in the day. The clearer skies will allow for a band of instability this afternoon along the Southeast Mountains and Raton Ridge. High moisture paired with backing winds will create a favorable environment for strong to severe storms. The slow motion movement of the storms (15 kts) will cause rain rates up to 2 inches per hour. The severe storms that form could have hail up to 2 inches in diameter and 60 mph gusts. Storms are expected to diminish by midnight. For more information on today’s flood threat, see the map below (hover over threat areas for more details). For Zone-Specific forecasts, scroll below the map. Partly cloudy this morning with sunny skies this afternoon. Daytime heating, low-level moisture and backing winds will provide an environment favorable for strong, slow-moving severe thunderstorms this afternoon. Rain rates up to 2 inches are possible as well as hail as large as 2 inches in diameter and 60 mph gusts. A Low flood threat has been posted for isolated flash flooding, debris slides and mud flows. Partly cloudy and cool for today with some light showers this morning. A few storms could develop where clouds dissipate early over the high country and Palmer Ridge. Max 1-hour rainfall up to 1 inch. Storms will begin to dissipate within a few hours of sunset. Sunny today with cooler temperatures. Decreasing winds will limit the fire danger for today. Temperatures will be 5F cooler than climatology. Upslope flow initiated isolated, high-based thunderstorms over the Palmer Divide and Southeast Plains again yesterday afternoon. Despite their high bases, the radar estimates for rainfall were over 3 inches in the storm cores. The severe thunderstorm that formed over rural Otero County had no rain reports, but CoCoRaHS stations in Elbert and Lincoln Counties reported rainfall amounts up to 1.5 inches. Limon Airport had 0.31 inches that fell and reported a wind gust of 40 mph. The main severe threat with these storms yesterday was the hail. There were 23 reports with hail size ranging from 0.75 inches to 2.75 inches in diameter. The astounding 2.75 inch diameter hail was reported by an Emergency Manager just north of Wiley, CO. Scattered thunderstorms and showers developed over the Northeast Plains and Urban Corridor with the arrival of the upper level trough late last night. The showers have persisted this morning over the Northeast Plains and produced local rainfall amounts of about 0.5-1 inches. Flooding was not reported on Thursday. Please see the STP map below for a look at 24-hour precipitation totals. 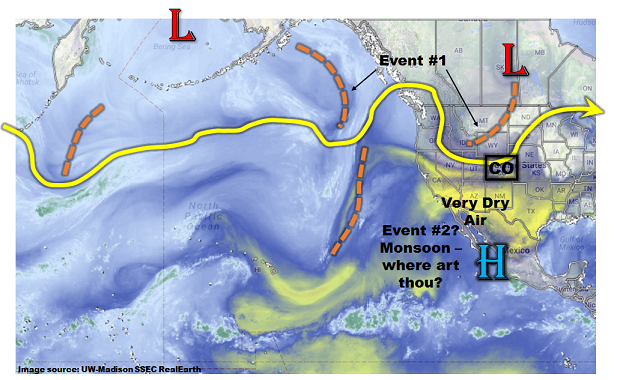 FTO 06-29-2017: Spotty But Heavy Rain For Holiday Weekend, Then Heat Is Back In Full Force, Then Monsoon? An active period is in store across mainly eastern Colorado for the Independence Day holiday weekend. 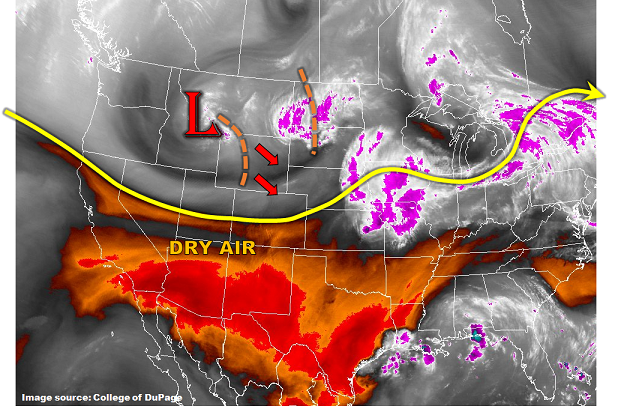 As the water vapor image shows, below, a large-scale trough is currently positioned northwest of Colorado. This is bringing a weak cool front southward during the afternoon hours and supporting some isolated to scattered storm activity. 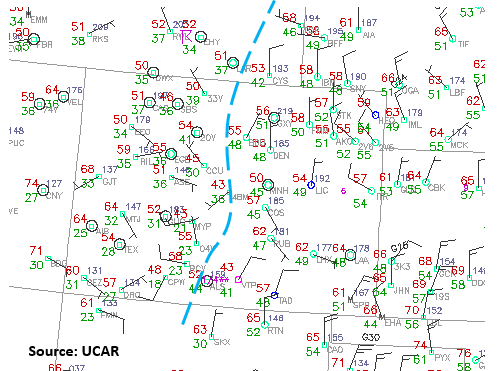 As the disturbance slowly moves eastward, return southeasterly flow will quickly regain control of eastern Colorado. This will push moist low-level air into our state, bringing about Event #1. Although we do not expect widespread heavy rainfall or flooding concerns, with the sufficient moisture, storms will have the ability to produce very heavy rainfall. Thus, an elevated flood threat. Just to reiterate: we expect this flood threat to be isolated in area on any given day. A significant pattern change will occur right around the 4th of July when a strong upper-level ridge (currently off the Baja California coast) begins to dominate the western North American circulation. Initially, it will be sprawled across the entire western U.S., but eventually it will reposition farther north. The prime impact from this type of circulation will be very hot weather with temperatures of 5-10F above average. Yes, this implies a multi-day period of 100F+ temperatures at elevations below 5,000 feet. 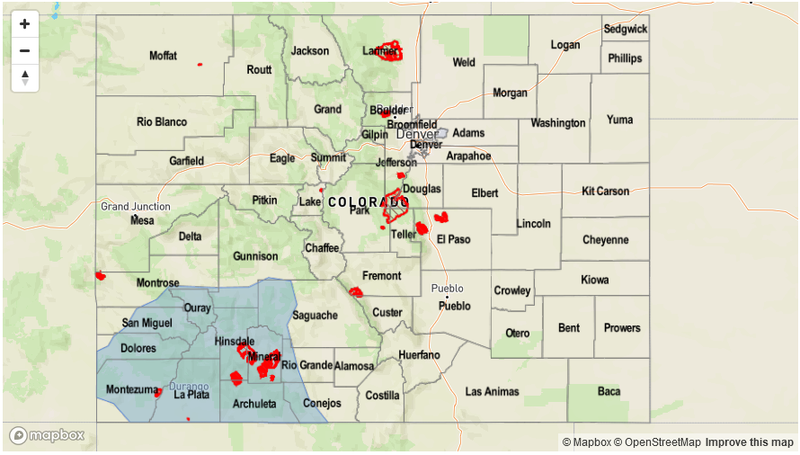 This is a concern for Colorado’s western slope, which has been hot and dry for weeks, with a prolonged period of elevated fire risk. This will continue for at least another 7-10 days. 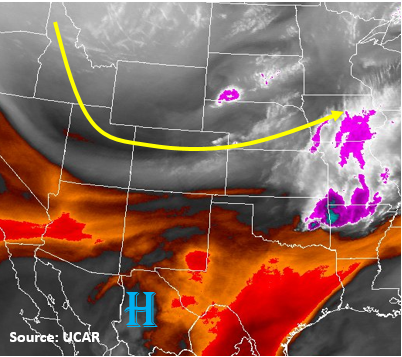 As the high pressure ridge continues to consolidate in a more northward position, this will eventually allow for easterly flow to transport moisture into all of Colorado (not just our eastern half). The forecast Precipitable water plumes, below, show this nicely. Note that at Denver, values stay close to seasonal normal for the next 7-10 days. While at Grand Junction, after an initially very dry atmosphere, there are finally indications of higher moisture after July 4th. Speaking of higher moisture in western Colorado, as we head into early July, we enter into an interesting period where average moisture tends to jump rather sharply. 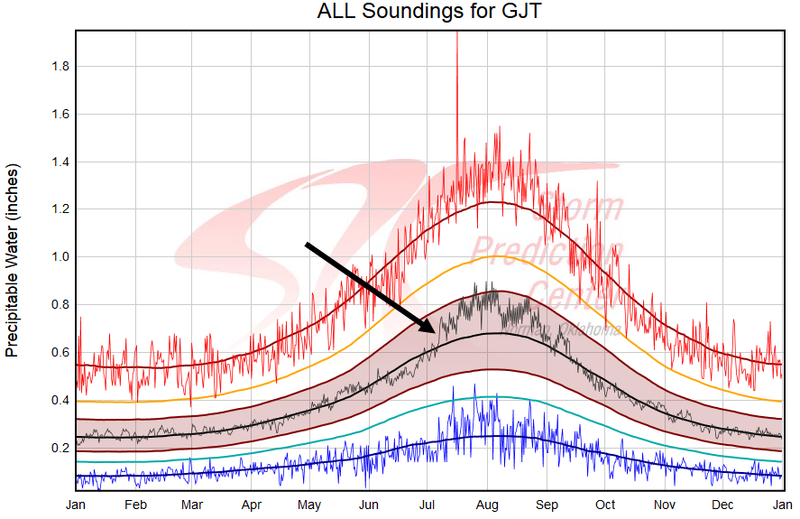 For example, looking at the climatological Precipitable Water percentiles at Grand Junction (source: Storm Prediction Center), below, note the quick increase in the median value (thin black line) from about 0.6 at the end of June to 0.7 in just a 7-10 day period. These kind of features can often be an important clue and complement to long range weather models. Below we describe each of the two identified precipitation events in more detail. 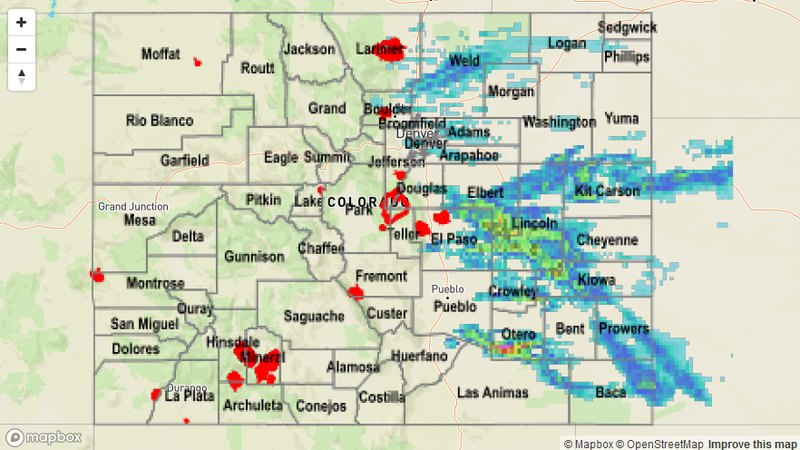 Return moisture will begin to advect into Colorado on Friday with scattered showers and thunderstorms likely across the higher terrain east of the Continental Divide as well as the Plains to the east. Isolated heavy rainfall and a flash flood risk (keyword isolated) appear likely. Conditions will continue to support heavy rainfall on Saturday and Sunday when a shortwave embedded in the jet stream will dive southeast and provide favorable upper-level dynamics for large-scale lift across Colorado. 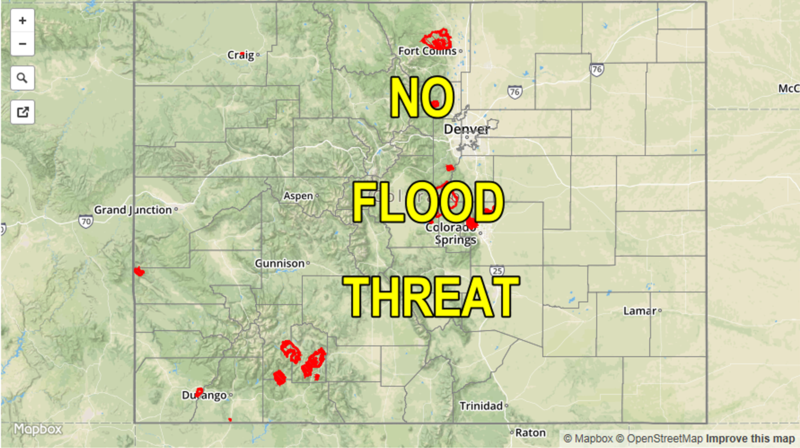 West of the Continental Divide, areas will continue to stay too dry to support much, if any rainfall. Instead, a prolonged period of gusty winds could continue to maintain the elevated fire danger. East of the Continental Divide, with sufficient moisture in place, scattered thunderstorms are expected both Saturday and Sunday. Highest coverage will be across eastern areas towards the NE, KS and OK borders where up to 2 inches of rainfall will be possible. Keep in mind, most of this will occur within a few hours on either Saturday or Sunday. Isolated flash flooding appears possible, hence the elevated flood threat. Severe weather, with the main threats being large hail and strong winds, looks to be a threat on Friday and Saturday, then less so by Sunday as shear slackens. By Monday (7/3), more stable air will overtake most of Colorado though residual moisture will likely support another day of isolated to scattered thunderstorms capable of short-term heavy rainfall across the southeast quadrant of the state. An important heads-up to all campers and hikers: isolated to scattered high elevation storms appear likely during the afternoon hours throughout this stretch. Even if a storm does not cause heavy rainfall, it could still produce hail, lightning and gusty winds. Furthermore, a storm can develop from “nothing” in as little as 20 minutes. Stay alert! The large scale pattern after Event #1 will feature anomalously high heights over the US Central Plains. In turn, this will promote hot weather across most of Colorado after the 4th of July with temperatures back to being 5-10F above normal. Thereafter, it continues to look like this strong ridge will migrate far enough northward to allow a feed of easterly disturbance that may be the first ramp-up of the 2017 North American monsoon. At this time, and with it being so early in the monsoon season, moisture is a key wildcard and continues to look marginal with Precipitable water staying below 0.75 inches. Nonetheless, with climatology starting to favor diurnal storm activity in the San Juans combined with enough support from long range GFS ensembles, we identify an elevated precipitation threat for southwest Colorado by Friday 7/7. At this time, a flood threat is not anticipated. A bit of change is in the air this morning, as hinted by the water vapor image below. The upper-level trough that entered the US Pacific Northwest 48 hours ago is situated over the Continental Divide this morning. It is bringing with it seasonably strong dynamics that will provide large-scale upward motion across Colorado throughout this afternoon and evening. The limiting factor regarding the heavy rainfall threat, however, is once again the lack of low level moisture. Although dew point temperatures this morning are as high as the mid-50s F in eastern Colorado, this is an illusion as this moisture is quite shallow. With another deep boundary layer expected today (courtesy of the June sun + clear skies), expect most of the meaningful moisture to “mix out” leaving a few clouds and isolated showers and a weak thunderstorm for most. The one exception will be in the Southeast Plains, where a stationary frontal boundary combined with another fresh cool front arriving this afternoon will act as a weak focal point for storm activity. Much like the past two afternoons, severe weather (gusty winds and hail) will likely be the main impact. Isolated short-term heavy rainfall, while likely, is not anticipated to exceed flood threat intensity. Thus, no flood threat is expected today. Out west, the elevated fire danger continues today, and will be further exacerbated by dry lightning that could accompany any weak storms that manage to form. Partly cloudy with scattered thunderstorms likely after noon, lasting into the late evening for far eastern areas. Max 30 minute rainfall up to 1.1 inch and max 1-hour rainfall up to 1.5 inches will be just under flood threat intensity; thus no threat is issued. However, severe weather will be likely, including hail up to 1.75 inches and gusty winds up to 75 mph. Sunny early then partly cloudy with isolated to scattered showers and weak thunderstorms possible during the afternoon. Max 30-minute rainfall 0.6 inches. Flooding is not expected today. Mostly sunny and cooler today. An isolated shower or weak thunderstorm cannot be ruled out over higher terrain. Max 1-hour rainfall up to 0.2 inches. Gusty winds and dry lightning will be more of a threat than rainfall. An elevated fire danger continues to exist today, with a Red Flag warning in effect for most of the area. 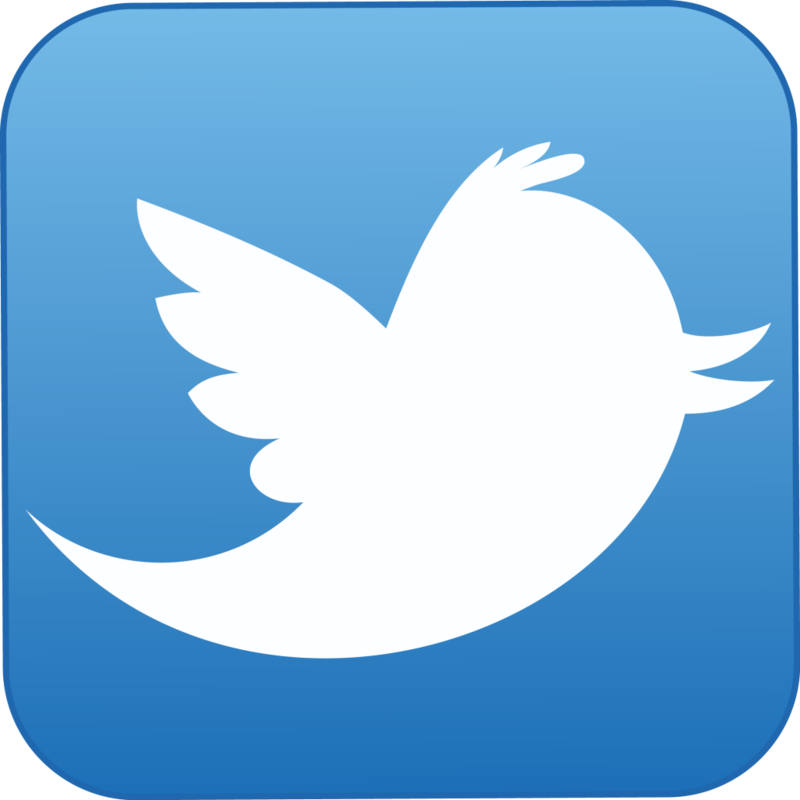 Please stay tuned to local National Weather Service offices for updates.